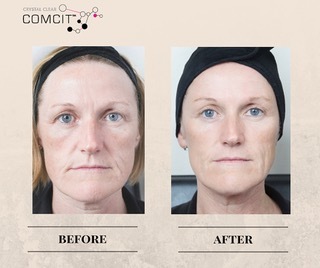 Crystal Clear COMCIT Elite is our new skin rejuvenation system, incorporating our ‘Cryo-Oxygen Microchanneling Collagen Induction Therapy’ (COMCIT) with industry-leading Microdermabrasion technology. 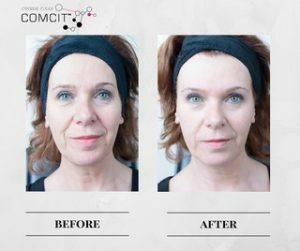 COMCIT is an effective and advanced system, which offers 4 simultaneous modes of action all designed to stimulate Collagen Production. Cryo Oxygen – Near freezing cold oxygen is pushed into the skint stimulate, energise and cool the skin to make the treatment pain free. Micro-Channelling – Creates micro channels in the epidermis/dermis junction to kick start a heal response process. Topical infusion – of active rejuvenating ingredients – are more effectively pushed into the skin layers as they have tiny channels to penetrate through. Oxygen infusion – A healthy and radiant skin is a breathing skin, where oxygen exchange between the cells functions perfectly. All living cells in the epidermis require and consume oxygen. Instantly smooth, fresh, firmer, plumper and more youthful skin. Promotion of new Collagen growth. 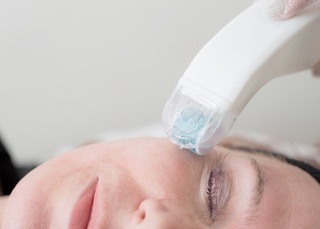 The H2O glow facial delivers freezing cold oxygen throughout the epidermis to nourish and invigorate skin cells, while the COMCIT roller allows Hyaluronic Acid to reach deeper dermal layers via micro-channels: plumping and rebalancing the skin from inside out. Enjoy a Beauty Flash microdermabrasion treatment to your face and neck before your Frozen Facial. Anti-ageing treatments don’t need to stop at the face. Skin is cleansed and exfoliated, then our COMCIT treatment is performed to the décolletage, tackling sun damage, lax skin and wrinkles. Pigmentation and sun damage are lessened while skin is plumped up and left looking more youthful, after being thoroughly cleansed, exfoliated and treated with COMCIT. A full cleanse and exfoliation is followed by a COMCIT treatment to the front and back of thighs to improve the look of skin and reduce the appearance of any stretch marks and cellulite. Helps to visibly reduce stretch marks and scarring after just one treatment. 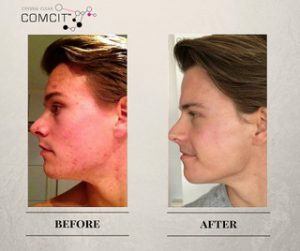 Skin is expertly cleansed and exfoliated, then COMCIT technology is used to painlessly break down scar tissue and encourage collagen production. Skin is expertly cleansed, Microdermabrasion tackles lines, wrinkles, pores, blackheads and dull skin, then our super repair mask is applied to hydrate, nourish and firm. Instantly polishes and buffs away dry, rough skin on the hands and feet, the perfect addition to a manicure or pedicure. Targets fine lines and wrinkles around the eye area, leaving you looking fresher and more awake. Skin is cleansed and Microdermabrasion is focused around the eye area and forehead, Then our Wrinkle Erase Pads are applied to the eye area to thoroughly hydrate and lift. Rejuvenate skin from the inside out. Plump out lines and wrinkles. Lift and firm lax skin. Hydrate skin giving an instant glow. Let the healing, anti-bacterial power of Oxygen work it’s magic on problem skin. Enjoy an expert cleanse and gentle exfoliation, then our powerful Oxygen Serum and Oxygen Therapy Machine are used to soothe and clm inflammation. 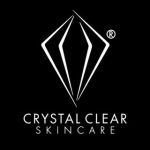 Moisture is locked in and skin purified with a Crystal Clear face mask, chosen to suit your skin type. An unrivalled luxury for tired, ageing skin. Lie back and have your tensions soothed away with a mimi back massage, then revel in our Oxygen Therapy Facial, followed by our Mini Lift Mask for extra firming and hydration. Using Oxygen to help heal scars and stretch marks on the body. Skin is cleansed and exfoliated, then cell generation is stimulated with our Oxygen Serum and Oxygen Therapy Machine.